Ham and Spinach Frittata! (Brunch or Dinner)! 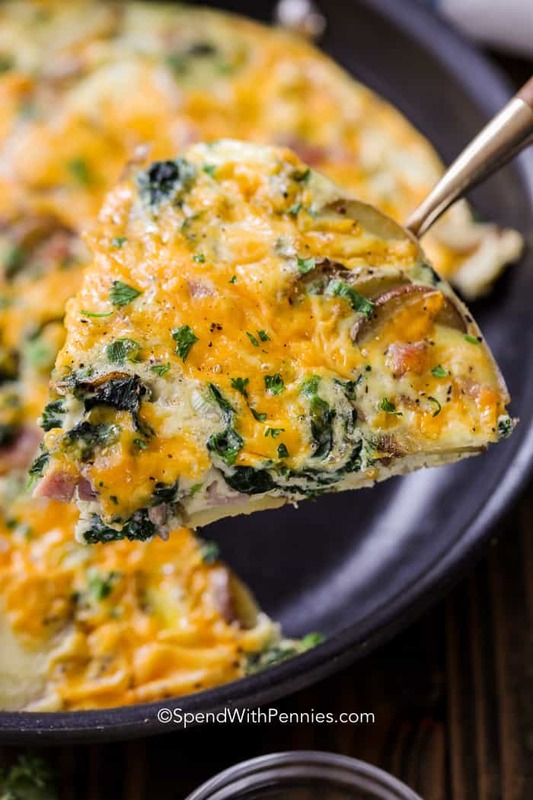 Ham and Spinach Frittata is a snap to assemble, quick to bake, and can be adapted to add in your favorite fillings! We love making homemade frittata for Sunday brunch, but it’s easy enough to be a weekday breakfast too (or even dinner)! Frittata is a very versatile recipe and you can add any combination of ingredients you’d like! This easy frittata recipe can even be made into spinach frittata muffins for a make ahead breakfast on the go! It’s easily made ahead and reheats well. Just add a side of home fries! 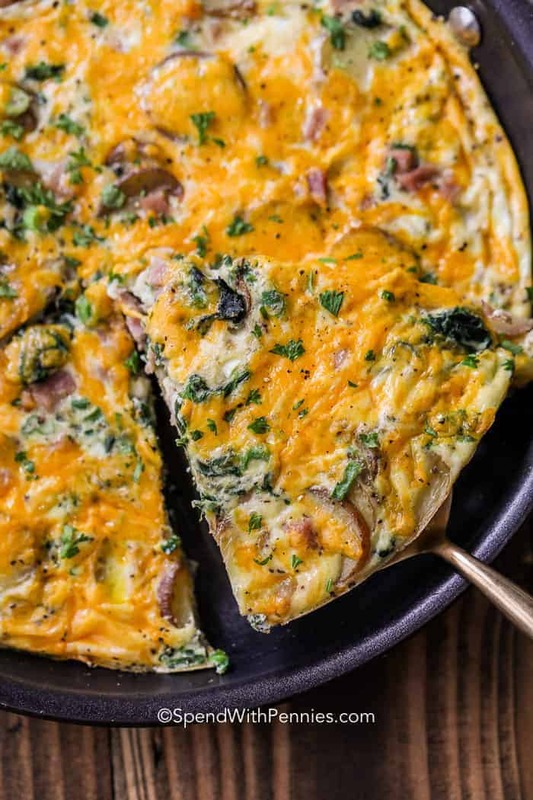 Like a quiche recipe, frittatas are egg-based recipes, but frittatas are crustless, which makes them perfect for people following a gluten free, Paleo or even a Keto diet (if you skip the potatoes). Both low carb and healthy! It’s similar to an omelet but can be easily scaled to serve a lot of people. The other difference between a quiche and a frittata is the ratio of egg/dairy; a frittata only has a bit of dairy. 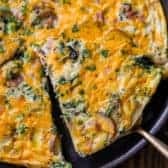 How to Cook a Frittata – There are a different ways to make a frittata, one being to cook the eggs stovetop until almost set and then broil/bake to cook the top. However, I find it easier just to bake frittata in the oven. 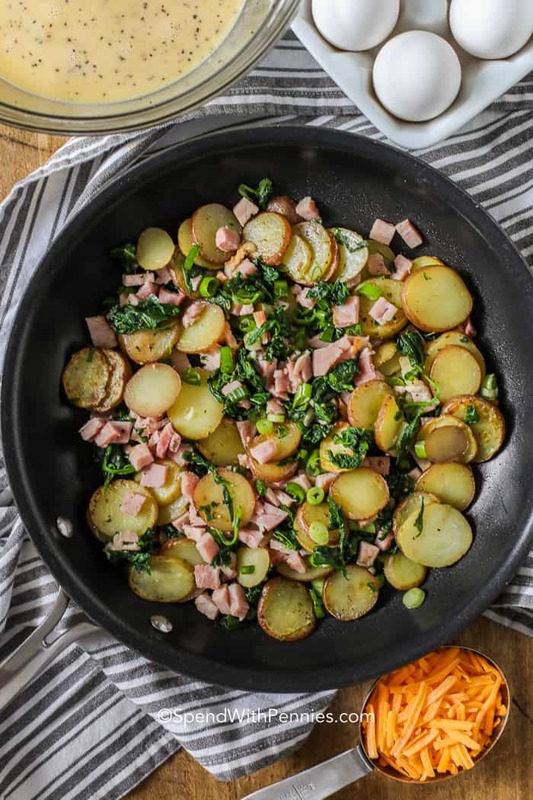 Cook your add-ins in an oven proof pan (potatoes, ham, spinach, and green onions). Whisk eggs, milk, and seasonings and pour over the add-ins. Top with cheese. Bake until the eggs are set, about 10 to 12 minutes. For a crispy top, broil for about 1 to 2 minutes. Cool for about 5 minutes before serving to make sure the eggs are set and the cheese is perfectly melted! It’s simple to make and tastes great! Make Ahead Egg Muffins – on-the-go deliciousness! Banana Breakfast Cookies – healthy and easy! You can mix and match the ingredients for this easy frittata! Fresh or frozen spinach can be used in this recipe! Cook your add ins (except cheese of course) and bake in the oven! Whatever is in the fridge and pantry can be tossed into a frittata from potatoes and leftover spaghetti to Roasted Butternut Squash, steamed broccoli or even Grilled Zucchini! Swap out the cheddar cheese (or add some crumbled feta or goat cheese). Why not try a spinach mushroom frittata or a spinach feta frittata? Cheese is an excellent compliment to eggs, any way you look at it! A frittata keeps for a few days in the fridge and reheats beautifully! It’s perfect to make ahead for lunches but it’s also great to put between a couple of slices of bread for lunch! If you’d like to keep it longer than that, you can freeze a frittata. Freezing egg-based dishes is easy. Make sure the frittata is fully cooled and then portion as desired and place in freezer containers or freezer bags. Egg-based dishes are easy to reheat in the oven or microwave. This spinach frittata recipe doesn’t disappoint when it comes to simple in every way! This ham and spinach frittata is a snap to assemble, quick to bake, and can go anywhere in a moment’s notice! Perfect for a Sunday brunch or a weekday breakfast. Heat olive oil over medium heat in a 10″ skillet. Add potatoes and 2 tablespoons water. Season with salt and pepper and stir. Cover and cook over about 10-15 minutes or until softened. Stir in ham, spinach, and green onions until hot and spinach is wilted. In a medium bowl, combine eggs, half and half, dry mustard and seasonings. Pour over potato mixture. Top with cheese. Bake 10-12 minutes or until eggs are set. Broil 1-2 minutes. Remove from the oven and cool 5 minutes before cutting. Serve warm. Stuffed Chicken Breast is one of our favorite easy dinner recipes. 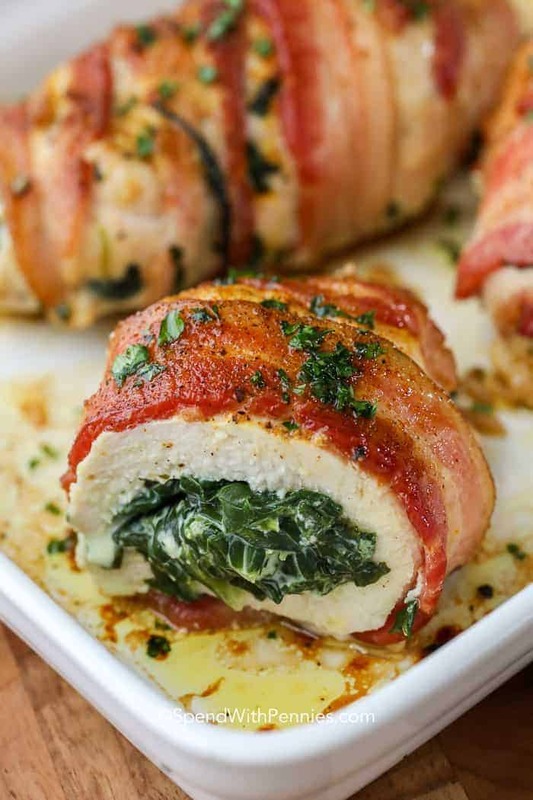 This chicken has a delicious cheesy spinach filling and is wrapped in smoky bacon then baked until tender and juicy. We love serving stuffed chicken breast on a bed of rice, or alongside some scalloped Potatoes and asparagus. It’s a delicious and versatile dinner that my family loves! Butterfly the chicken breasts (see below for details). Create the filling and cool completely. Add filling to butterflied chicken. Add cheese. Close the chicken, wrap with slices of bacon and secure with toothpicks. Bake until juicy and golden (165°F). Whole, skinless chicken breasts can be quite thick. When making this stuffed chicken breast recipe, you’ll want to use an easy technique called “butterflying”. Hold the thinner end of the chicken breast with a paper towel, or with the tines of a fork (skinless raw chicken can be slippery). Using a sharp knife with a thin blade (a filet knife is great if you have one), slice through horizontally most of the way through. Leave about 1″ towards thicker end intact. Open the chicken breast (like a book) and using a meat mallet, pound to an even thickness according to your recipe. The ingredients in this spinach and cheese stuffed chicken breast are pretty simple and quick to prepare! 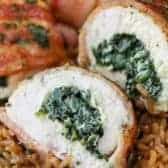 Spinach for Stuffed Chicken: I most often use fresh spinach but of course you can Fresh Spinach for Frozen and vice versa. 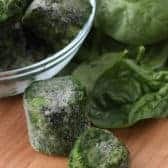 If you’re using frozen spinach, thaw it thoroughly first and take up a handful and squeeze out the water before mixing it with the cream cheese. If you’re using fresh spinach, cook it first. Cheese for Stuffed Chicken: I love the combo of spinach and Swiss cheese (plus swiss tends to holds up well when baked) but you can use any cheese you like! Feta is also a great option. I use garlic and herb cream cheese for flavor but plain works as does any flavor you like! Baked stuffed chicken breast should be baked in an uncovered roasting pan for 35-45 minutes in a preheated 375°F oven. Chicken breasts can vary from 5oz to 10oz in size so I always use a thermometer to make sure it reaches the poultry-safe cooked temperature of 165°F (the perfect temperature for any Baked Chicken Breasts. 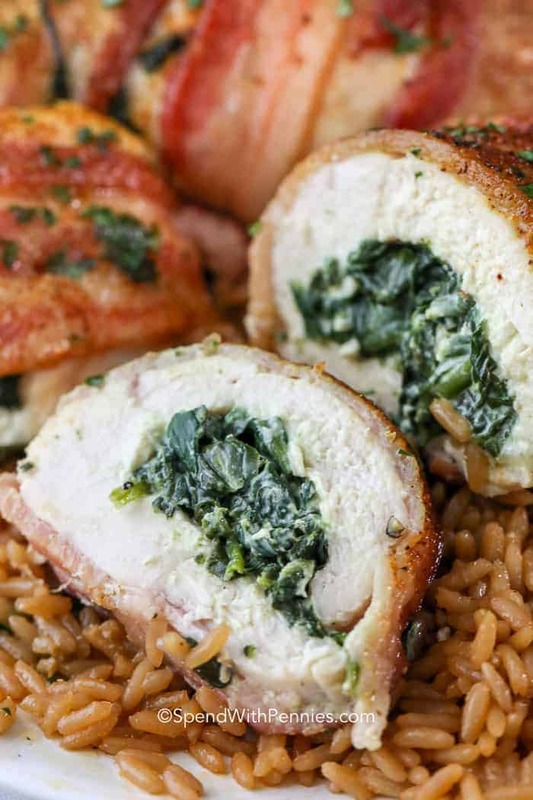 When done, allow your spinach and cheese stuffed chicken breast rest for several minutes before serving (to firm up the cheeses and let the juices settle). Baked stuffed chicken breast is classic comfort food. Serve spinach stuffed chicken breast with a fresh Kale Salad, Easy Oven Roasted Potatoes (or Mashed Potatoes) and your favorite veggie side dish! Crispy Baked Parmesan Chicken – Classic chicken parmesan made easy! Roast Chicken & Vegetables – A complete meal in one baking dish! Chicken Piccata – Lemony and delicious! The BEST Chicken Salad – Honestly the best. So good! Stuffed chicken breast is one of our favorite recipes ever. 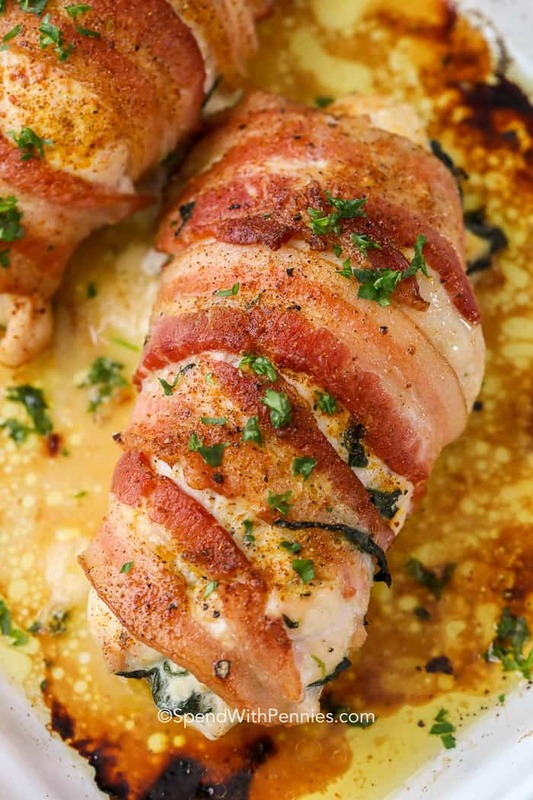 This bacon wrapped stuffed chicken breast is stuffed with Swiss cheese and spinach, then baked until tender and juicy. Chop spinach and place in a non-stick pan over medium heat. Stir until wilted. Add cream cheese and stir until melted and creamy. Cool completely. Butterfly chicken breast (so you can open it like a book) and pound to 1/2″ thickness. Divide the spinach mixture over each and close chicken around the spinach. Wrap each breast with 2 slices of bacon and secure with toothpicks. Season with cajun or chicken seasoning if desired. Bake on a pan for 35-40 minutes. If you don’t have flavored cream cheese, add a pinch of garlic powder, salt and pepper to taste. 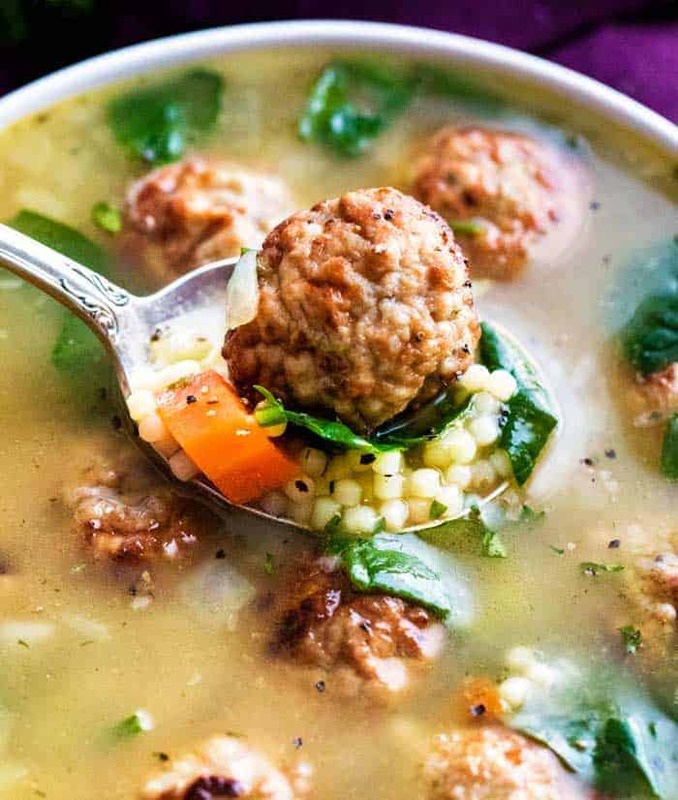 Comforting, Quick Italian Wedding Soup! Italian Wedding soup is a hearty, classic soup made on the stovetop! This recipe comes together quickly for the perfect weeknight meal! Add some 30 Minute Dinner Rolls or a big piece of crusty bread and a fresh salad to round out the meal! 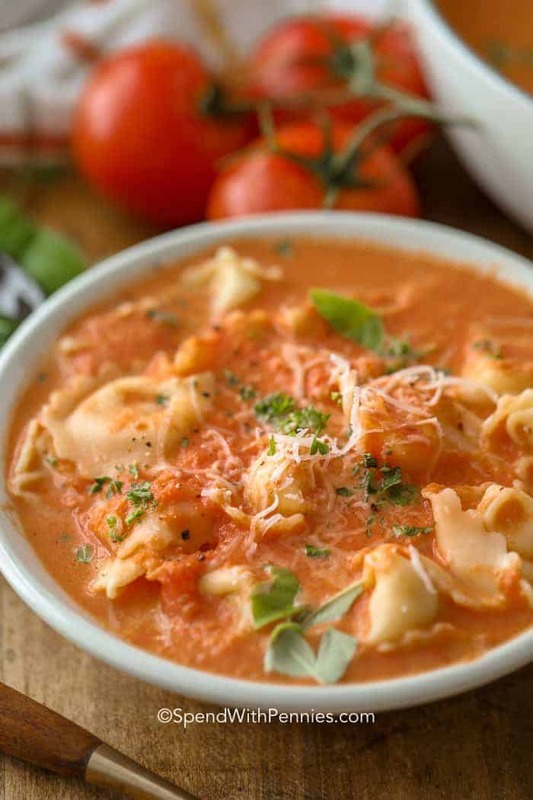 This time of year, soup is a go-to meal for us. On a bone-chilling cold night, there’s nothing better than wrapping both hands around a warm, steaming bowl of soup! Normally we go for a hearty minestrone or loaded potato soup, but lately I’ve been getting requests for a classic Italian Wedding soup. For dessert, we love to add Tapioca Pudding or Creamy Rice Pudding, both also perfect to warm you up from the inside out. Why is it Called Italian Wedding Soup? Ever wonder how it gets its name? I always thought maybe it was a traditional meal served at Italian weddings, but in actuality, it has nothing to do with a real wedding. The name actually comes from the way the flavors combine, like a happy marriage! What Pasta is Used in Italian Wedding Soup? Traditionally, acini di pepe pasta is used, which looks like little pearls. If you can’t find that pasta, ditalini or orzo pasta could be used. My local grocery store had the acini di pepe pasta right in the dried pasta aisle. 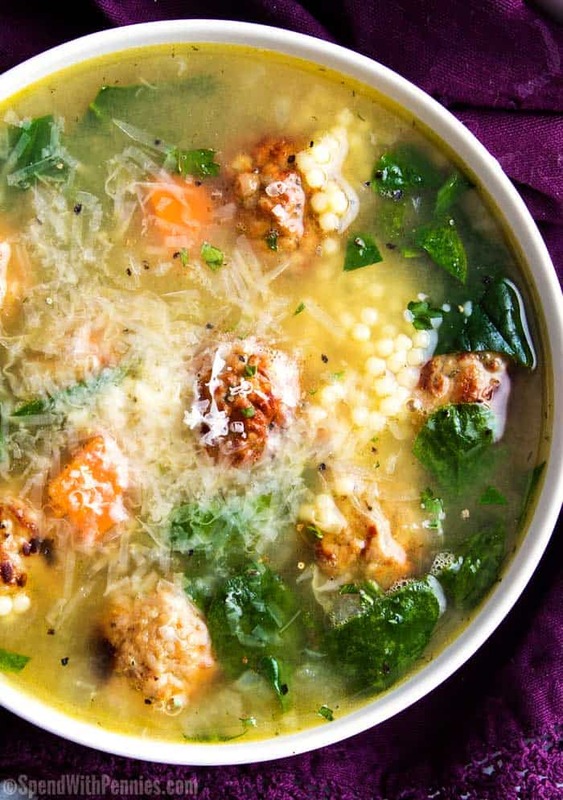 How Do You Make Italian Wedding Soup? 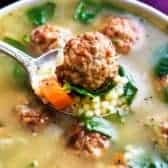 Italian wedding soup is such a simple soup to make. The part that takes the most time is making the meatballs. You can use any combination of ground meat you like. My favorite combination is either pork and beef or all chicken. I like to brown the meatballs in the soup pot, to add tons of extra flavor! Soften onions, carrots & celery. Add herbs and seasonings. Stir in broth and pasta and cook until pasta is tender. Can You Use Frozen Meatballs? Sure can! I like to make double the meatball recipe and freeze the other half, but when I don’t have any pre-made meatballs, I reach for my favorite bag of frozen meatballs! Just make sure you’re using the small meatballs. Can You Freeze Italian Wedding Soup? Absolutely! For the best results, I like to freeze the soup before adding the pasta. Then when you’re reheating the soup, go ahead and add the pasta. Instant Pot Chicken Noodle Soup – quick! 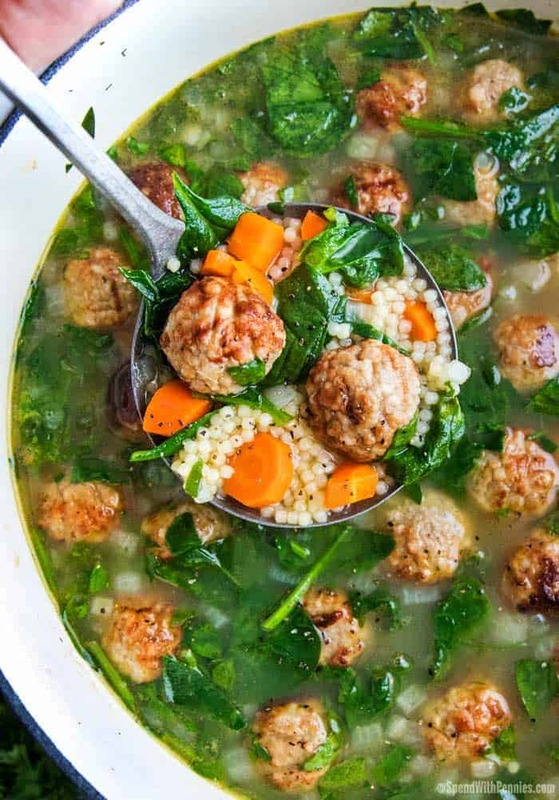 Hearty and classic, this easy stovetop Italian Wedding soup comes together quickly and is perfect for any weeknight meal! Add all meatball ingredients except olive oil to a large mixing bowl. Gently mix until fully combined. Shape into small meatballs, about 1 inch in diameter. Heat 2 Tablespoons olive oil in large dutch oven over medium high heat. Add about half the meatballs and cook about 3 minutes per side, turning to brown all over. Transfer to plate. Repeat with remaining meatballs. Add 1 Tablespoon olive oil to the same dutch oven and reduce heat to medium low. Add the onion, carrots and celery and cook 5 minutes, until softened. Add garlic and cook 30 seconds, or until fragrant. Season with salt, pepper, and dill. Add wine and deglaze the pan, scraping the bottom of the pot with a wooden spoon to loosen any browned bits. Add the chicken broth and bring to a boil. Add pasta and meatballs to the pot and cook 8-10 minutes, until pasta is tender and meatballs are cooked through. During the last minute of cooking, add spinach and let it wilt. Serve hot, sprinkled with shredded Parmesan cheese. 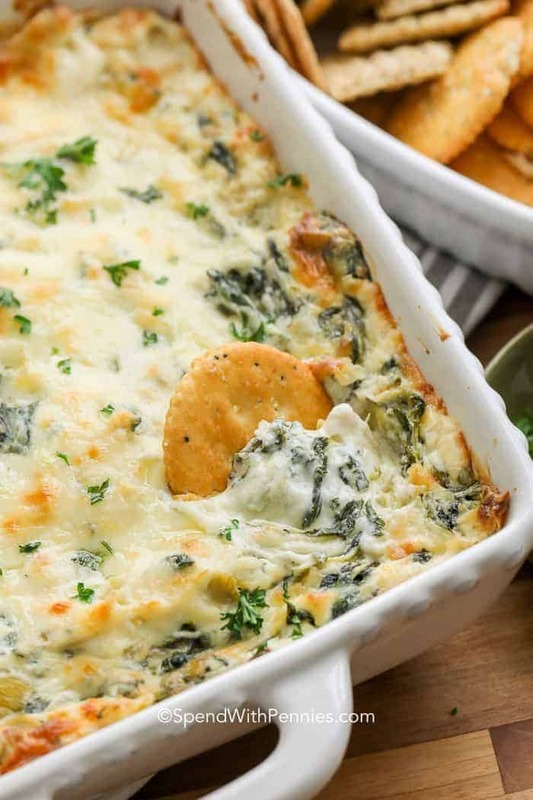 This Spinach Dip Recipe is an easy appetizer or party dip that absolutely everyone loves! A rich and creamy base is mixed with tender spinach leaves, water chestnuts and green onions for the perfect party mixture. Serve this cold spinach dip with chips, crackers or garlic baguette or use a loaf of bread as a bowl! Spinach Dip has always been a favorite of mine, I could eat this stuff by the truckload! This version is pretty well known for good reason. As much as I love a good hot Spinach Artichoke Dip, this cold spinach dip has been a staple on my party tables for as long as I can remember. It is so fast to make and doesn’t require any cooking. 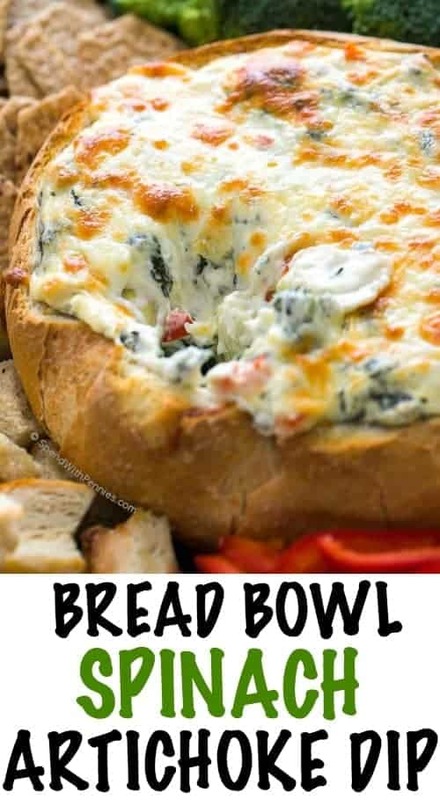 This is not a baked spinach dip, it’s served cold and often in a “bread bowl” which is so good! Simply select a loaf of crusty bread, hollow out the middle (save the bread in the middle) and fill it with the spinach dip before serving. Any of the bread that was in the middle can be cubed for dipping (and of course as the dip is low, the bowl itself is perfect for tearing off pieces and dipping too)! 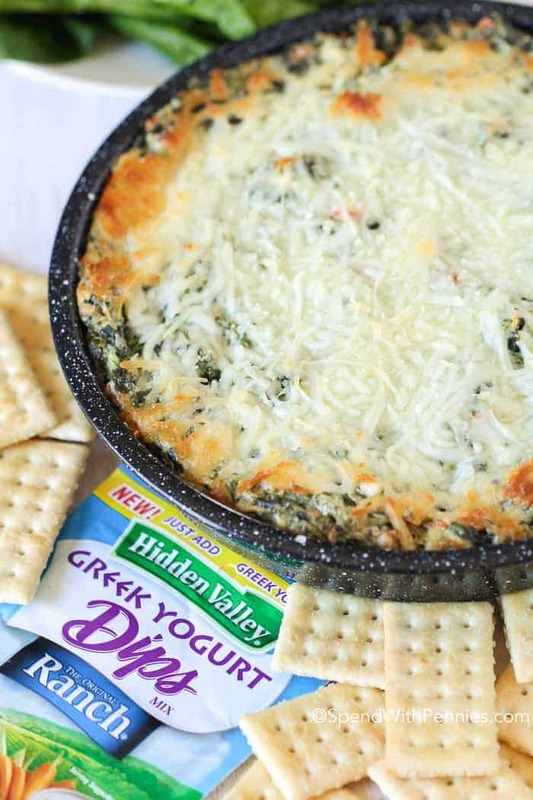 Spinach Dip is also great served with crackers, tortilla chips, bread or veggies as dippers too! Creamy Base: This dip is so easy to make! I start with mayonnaise but using light or low fat dressing or even miracle whip works perfectly in this recipe. When adding sour cream, I often replace it with no fat Greek yogurt and to be honest, you can’t tell the difference. 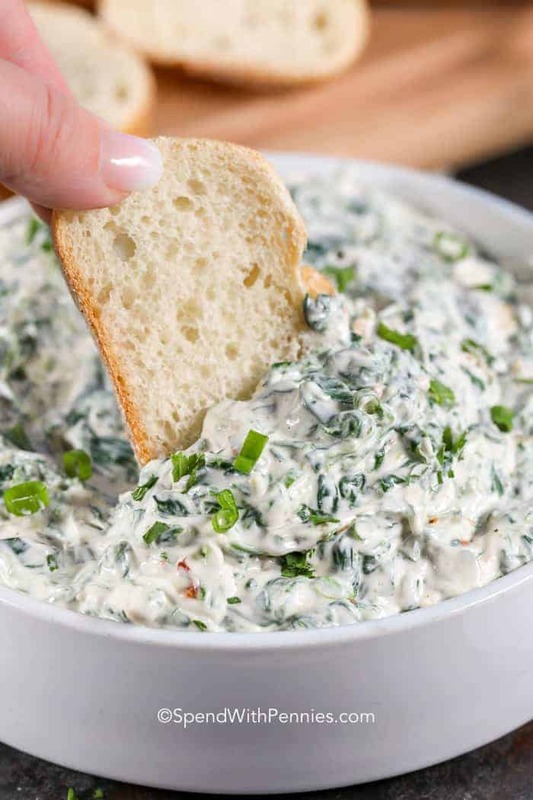 I love to make spinach dip with Greek yogurt because it really cuts the calories and fat but nobody can tell the difference! 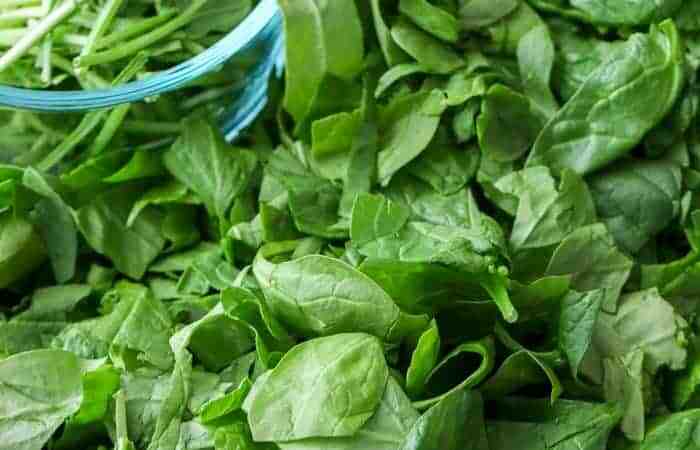 Spinach: This recipe uses frozen chopped spinach but you can replace frozen spinach with fresh spinach. Simply cook it down and squeeze it dry. Add Ins: Water chestnuts add great crunch and texture to this spinach dip. If you don’t have them on hand, you can substitute diced celery or even bell peppers. Seasoning: The quintessential seasoning for this dip is Knorr Vegetable Soup mix (Lipton makes one as well). It is the perfect seasoning and adds lots of color and flavor. If you’d like to make this spinach dip without soup mix, you can add in your own seasonings and herbs! I’d suggest either a homemade ranch seasoning mix or garlic powder, onion powder, parsley, salt and pepper with finely diced red bell pepper and a bit of shredded carrot. Yes, spinach dip can be frozen. While it’s usually fine, depending on the type (brand and low fat etc) of dressing you use plus the dairy, it can be a bit watery when defrosting. If that’s the case, line a colander with paper towel/cheese cloth and let it sit for a little bit to drain any liquid. 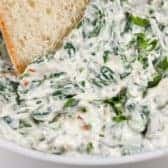 Leftover Spinach Dip is perfect to spread on sandwiches, make into a grilled cheese, add to creamy chicken casseroles or pasta sauces or to turn into a delicious Spinach Artichoke Dip Pasta Salad! The BEST Buffalo Chicken Dip – Amazing! 5 Minute Taco Dip – Quick party Dip! Jalapeno Popper Dip (Video) – Popular! A simple creamy spinach dip recipe perfect for any party! Defrost spinach overnight in the fridge or in the microwave. Squeeze dry. Chop water chestnuts and combine all ingredients in a bowl. Mix well. Serve with bread, crackers or vegetables for dipping. Here’s how to substitute fresh spinach for frozen. Fresh spinach can be substituted for frozen once you understand how to calculate the substitution! Commercially frozen spinach is usually chopped then boiled or blanched and flash frozen, resulting in the kind of texture that goes well in soups, spinach dips, casseroles and egg dishes. Now you can make your own at home and freeze it (or use it fresh in recipes requiring frozen spinach). Most varieties of frozen spinach come in 10 oz packages and needs to be drained once it’s thawed because it will produce a lot of water. A 10 oz package of frozen spinach is the equivalent about a 1 pound bunch of fresh spinach. 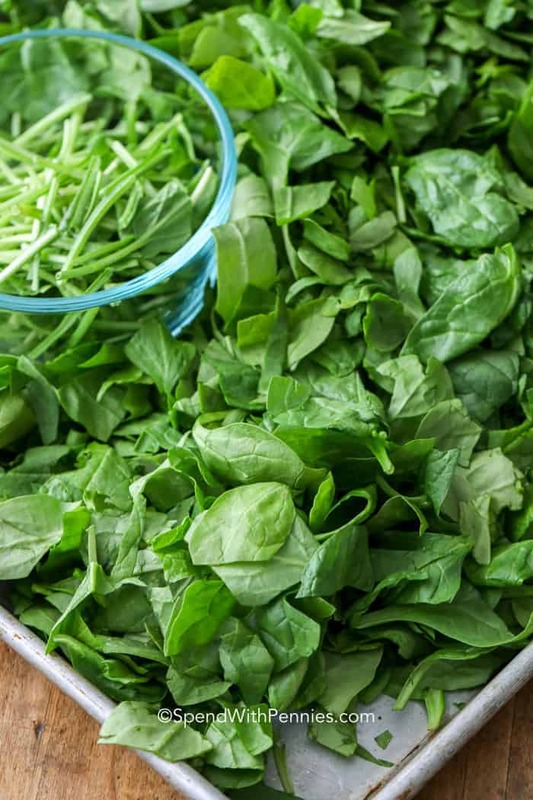 If you’re buying fresh spinach, it’s wise to buy more than you think you’ll need because some bunches will need the stalks trimmed off and that will decrease the weight before cooking. A good rule of thumb is fresh spinach cooked down equals about a cup and a half, which is roughly the equivalent of a 10 oz frozen package. Fresh spinach is more fibrous but will cook down considerably and needs to be drained once it’s cooked down. The nice thing about cooking down fresh spinach is that you know it is 100% fresh and you can season it any way you want to while it’s cooking down. Fresh spinach works best in salads or sautéed as a side dish like Creamed Spinach. The easiest way to cook down spinach is to cut the spinach into small pieces and give it a quick cook in a non-stick pan. After the spinach has cooked down, remove from heat and scoop into a colander so the excess water can drain out and cool enough to be able to handle it. Like many dips, you’ll need a package of frozen chopped spinach, defrosted and squeezed dry. 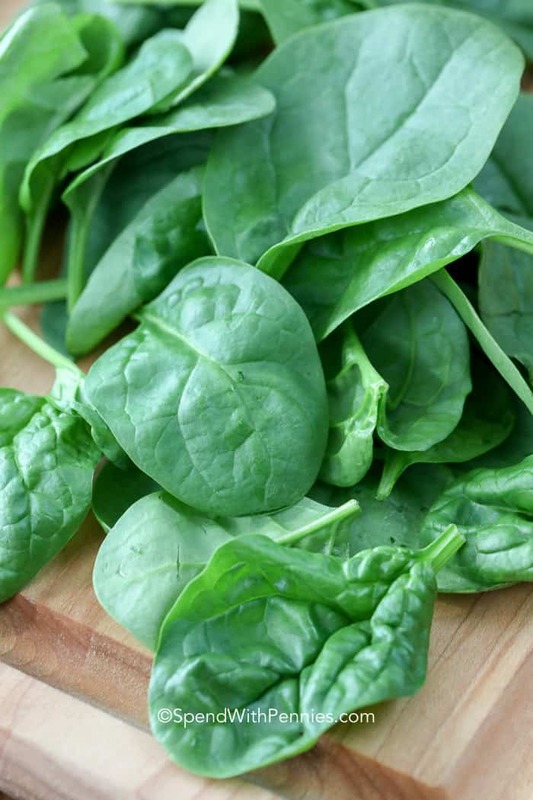 Frozen chopped spinach is a great choice, it’s easy to use and perfect for dips but if I have fresh spinach to use (or don’t have frozen handy) I substitute fresh spinach for frozen spinach. You will need, just one ingredient… 1 lb of fresh spinach. This will look like a lot of spinach but don’t worry, it reduces to approximately 1 1/4 cups or so. Remove any long or tough stems. Place the fresh spinach in a large non-stick pan for over medium high heat. Cook, stirring occasionally until the spinach is cooked through (3-4 minutes). Cool slightly. Place spinach on a cutting board and chop. Using your hands, squeeze as much liquid out of the spinach as possible. Separate (or fluff it up) and use as directed in your recipe. This is a great method to use fresh spinach instead of frozen but it’s also great to use if your spinach is ready to expire. Simply follow the instructions above and then freeze the cooked and cooled spinach in a freezer bag for future use. The Best Spinach Artichoke Dip – The BEST!! Spinach Artichoke Cheese Ball – So pretty! Classic Stuffed Shells Recipe – Family favorite! This recipe replaces 1 package of store bought frozen spinach. Wash spinach and spin to dry in a salad spinner (or dab dry). Place the fresh spinach in a large non-stick pan with olive oil over medium high heat. Cook, stirring occasionally until the spinach is cooked through (3-4 minutes). Cool completely and use in place of frozen spinach in your recipe as directed or freeze in a medium sized freezer bag. Most recipe will require the spinach to be defrosted and squeezed dry before adding to the recipe. 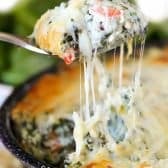 This Cheesy Ranch Spinach dip recipe is packed with spinach and peppers and fully loaded with delicious ranch flavor! It can easily be prepped ahead of time for a delicious dip perfect for any party! We love Buttermilk Ranch Dressing and as much as I love a traditional Spinach Artichoke Dip, sometimes we like to switch it up which the flavor of ranch! I have partnered with Hidden Valley Ranch to bring you this amazing dip! This a great hot spinach dip recipe, loaded with flavor from both fresh spinach and ranch seasoning mix! We are big veggie lovers in our household! While I do love a traditional cold spinach dip recipe, there’s really nothing quite like a hot bubbly cheese dip out of the oven! Adding diced peppers to this dip makes for great flavor! While I used fresh spinach in this recipe, of course you can substitute frozen chopped spinach as well! Be sure to squeeze it to drain well. 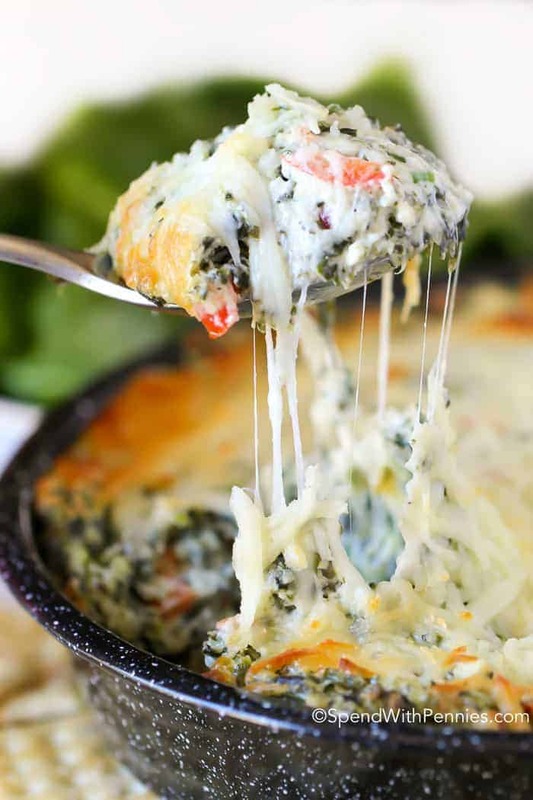 This Ranch Spinach dip recipe is packed with spinach and peppers and fully loaded with flavor! This dip is easy to make and has so much great flavor! 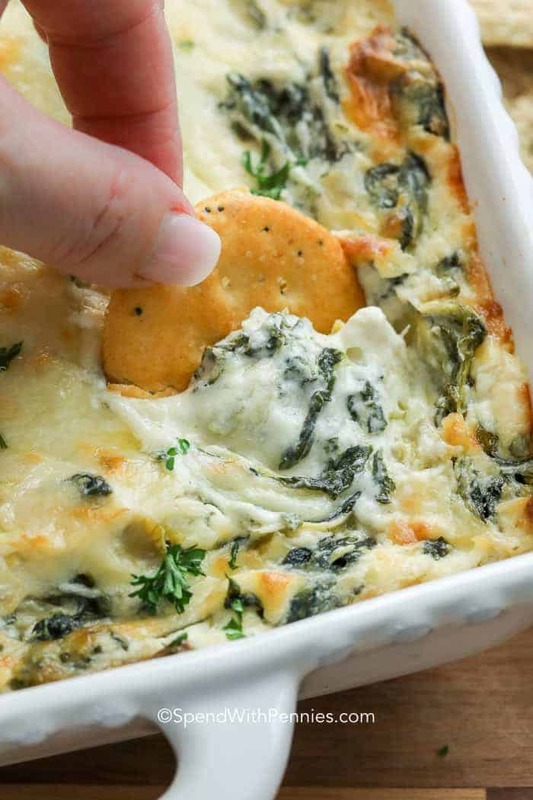 Here are a few tips to make sure you have spinach dip perfection! Use a hand mixer to combine the cream cheese, this makes it softer and easier to scoop. Squeeze all of the water you can out of the spinach. Change the cheeses to your favorites, a bit of gruyere or cheddar are great in this recipe. Low fat or light products can be used in this recipe. Make up to 48 hours in advance and refrigerate. May need a bit of extra cook time if it’s chilled. 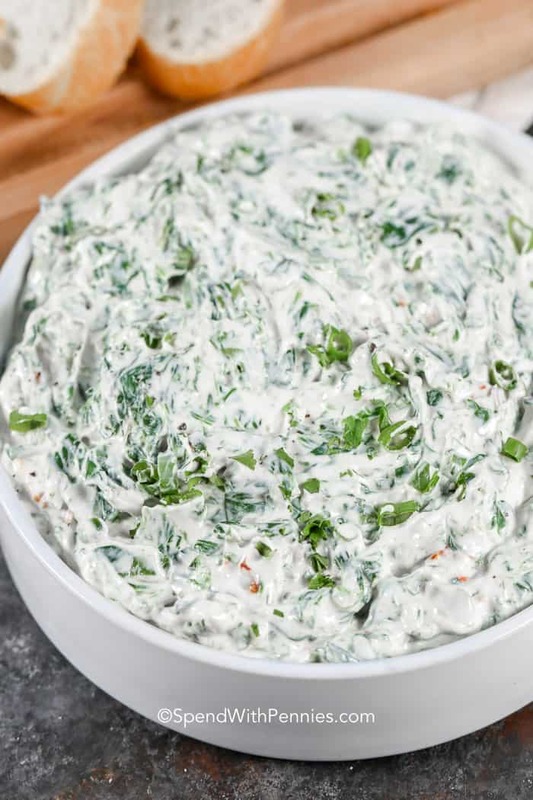 Not only is it perfect for any gathering, this spinach dip recipe can actually be prepared a day in advance and put it in the oven just before serving! Either take it out of the refrigerator 30 minutes before baking or add a few minutes extra bake time. The BEST Buffalo Chicken Dip (video) – Favorite recipe! Easy Queso Dip – Easy and cheesy! 5 Minute Taco Dip – Super quick and easy! This Ranch Spinach dip recipe is packed with spinach and peppers and fully loaded with delicious ranch flavor! Wash and roughly chop spinach. Place in a non-stick pan over medium heat until cooked. Cool completely. Once cooled, squeeze as much liquid as possible out of the spinach. Combine cream cheese, sour cream, mayonnaise and ranch mix with a hand mixer until fluffy. Fold in remaining ingredients except 1/2 cup of mozzarella and spread into a 2 quart casserole dish. Top with remaining cheese and bake uncovered for 25-30 minutes or until hot & bubbly. You can follow Hidden Valley on Facebook, Pinterest, Instagram or Twitter or check out Hidden Valley online for lots of great recipes and inspiration! 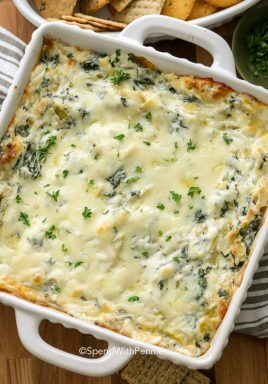 Creamed Spinach side is a wonderful addition to any holiday meal and the perfect side for any weeknight meal! It’s quick, easy and delicious! We often serve this creamed spinach recipe with Pork Tenderloin or a juicy steak but to be honest, I love it spooned over Mashed Potatoes too! From Spinach Artichoke Dip to Spinach Pinwheels, I love the combination of sweet spinach and a creamy base. Creamed spinach is a side dish often served with steaks or even Oven Baked Chicken Breasts. 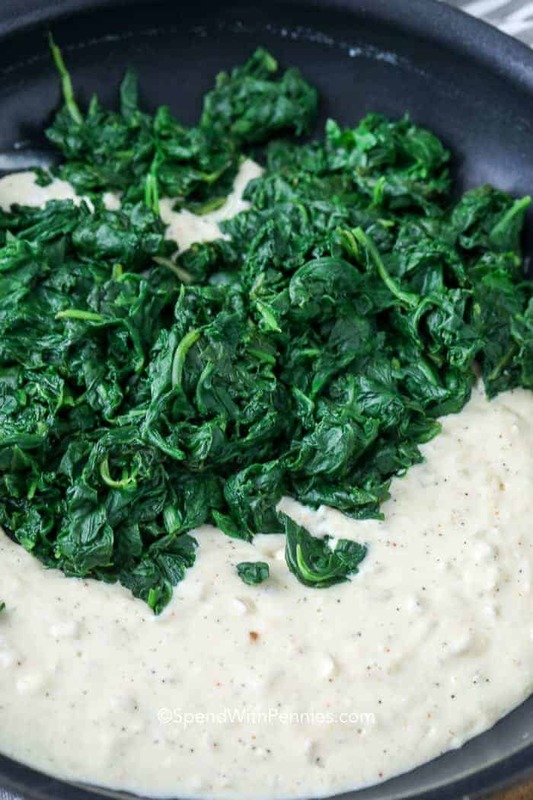 This recipe is a delicious combination of tender sweet spinach in a creamy sauce (and has been a favorite of mine since I was a kid)! Creamed Spinach starts with fresh spinach (although you can use frozen), stems removed and chopped. I prefer the flavor of fresh spinach as it has a more delicate flavor. For four servings of creamed spinach you will need 1lb of fresh spinach. It will look like a huge mountain of spinach but it cooks down to a very small amount! 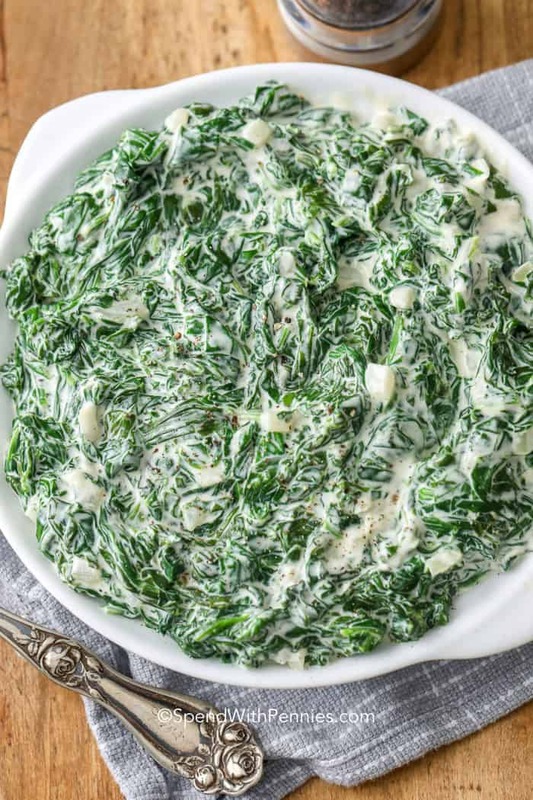 While it may not be traditional, the addition of cream cheese makes a the sauce rich and creamy and turns this into the go for seconds kind of creamed spinach! What makes this creamed spinach recipe a stand-out? This easy side dish recipe is easy to make, full of flavor and reheats well! Remove stems from spinach and chop. Cook spinach in a pan 3 minutes, drain. Heat sauce ingredients and seasonings. Stir in spinach and serve. 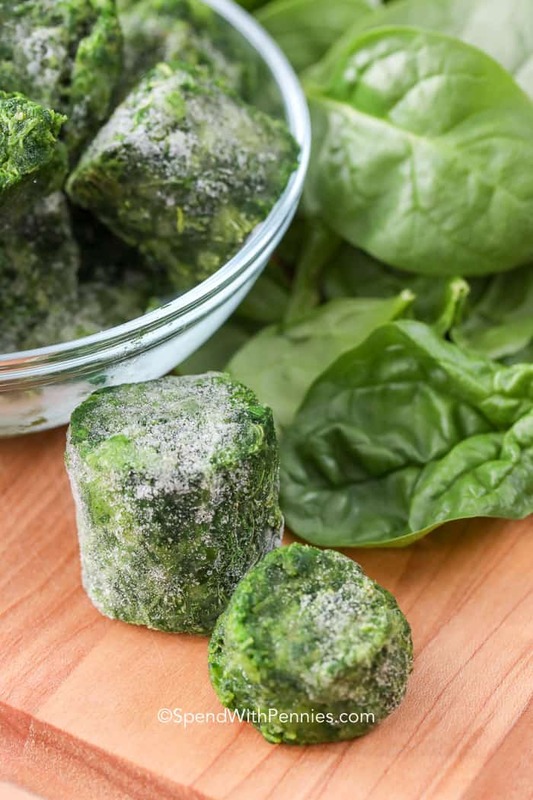 If you are using frozen spinach, be sure to thaw and squeeze dry so your dish isn’t watery! For fresh spinach, a good rule of thumb is to chop about 16 ounces of trimmed spinach to equal a standard 10 package of frozen spinach. Remove any tough stems before chopping. Roasted Root Vegetables – set it and forget it! Classic Deviled Eggs Recipe – truly a classic! This easy creamed spinach side is a wonderful addition to any elegant holiday meal, a neighborhood potluck or even a holiday work function. Wash and dry spinach if using fresh. Remove any tough stems and roughly chop. Cook spinach in a pan with olive oil over medium heat until wilted and cooked through, about 3 minutes. Remove from pan and place in a strainer to drain. Add onion and butter to the pan and cook on medium low heat until onion is softened. Add remaining ingredients and bring to a simmer while stirring until smooth. Simmer 1-2 minutes or until thickened. Squeeze any excess moisture out of the spinach. Add back to the pan and stir to combine. Heat through and serve. Spinach Artichoke Dip is one of those recipes that absolutely everyone seems to love. A creamy cheesy base loaded with spinach, a bit of garlic and of course marinated artichokes. It’s all topped off with more cheese and baked until golden and bubbly. Between this recipe and our favorite Buffalo Chicken Dip, I’m pretty much guaranteed an invite to every party! Spinach Artichoke Dip is a dish you’ll find on almost every menu and at every party for good reason. Everyone loves it! 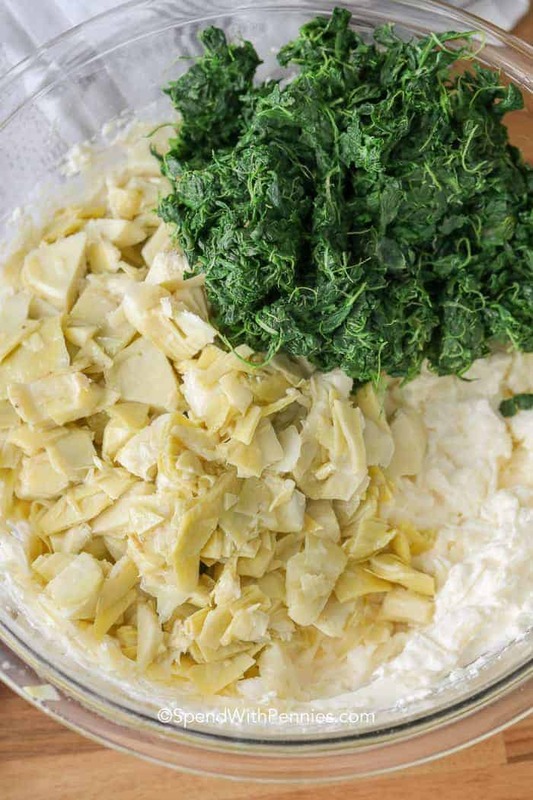 This spinach artichoke dip recipe is easy to make and it’s creamy, cheesy, and super satisfying! 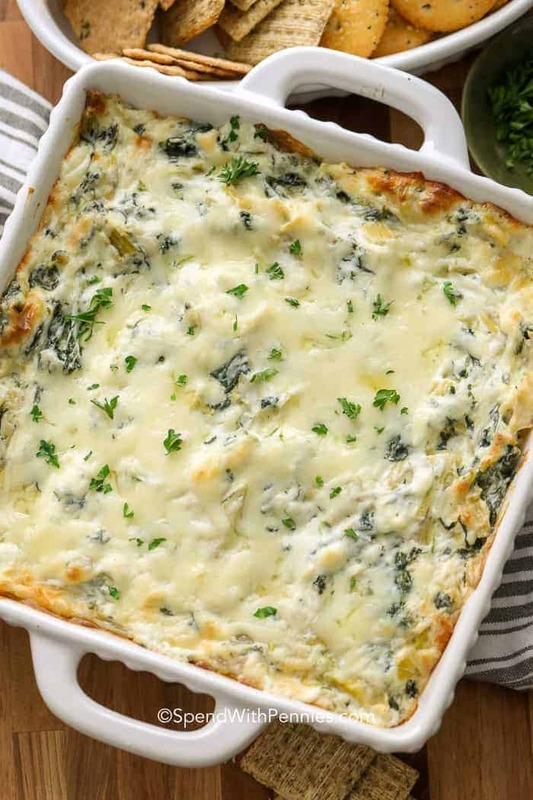 Like most creamy dip recipes, this spinach artichoke dip starts with a delicious cream cheese base. The first step to a perfectly scoopable spinach dip is to make the cream cheese nice and fluffy using either a hand mixer or a stand mixer. You can certainly mix it by hand but an electric mixer will make your dip softer so you don’t end up with a ‘chip-wreck’. I love the use of marinated artichokes in this recipe (instead of canned). The difference is that the canned artichokes are usually in water with a bit of salt… the marinated artichokes are in olive oil and usually have lots of great seasoning which adds tons of flavor to this dip! If you’re using canned artichokes instead, you’ll likely want to add a bit of Italian Seasoning or some dried basil for flavor. Mix cream cheese, sour cream and a bit of mayo until fluffy. Fold in spinach, artichokes and cheeses. I used to make this dip with lots of gruyere but have found it’s better if you use some mozzarella and a bit of gruyere. If you don’t have gruyere you can substitute it with gouda or swiss. Can you use fresh spinach for spinach dip? Yes, you can use fresh spinach in this recipe instead of frozen spinach! 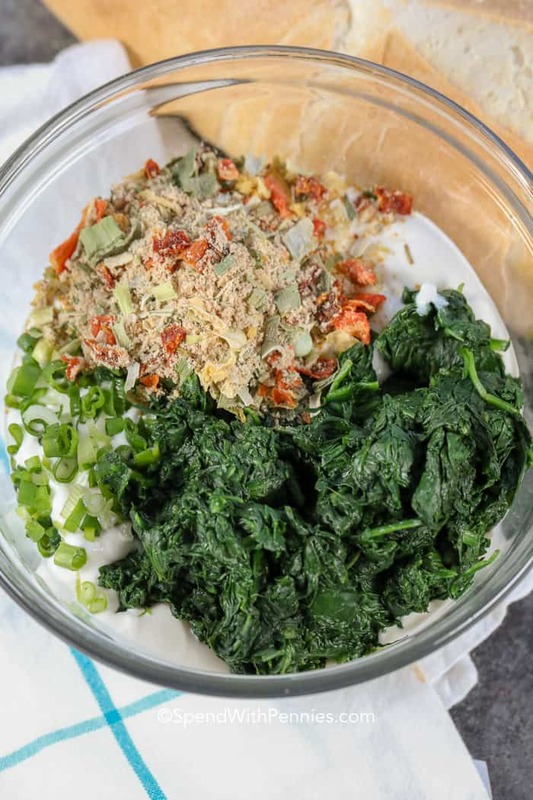 I use frozen chopped spinach to keep this spinach artichoke dip quick and easy. Frozen spinach tends to have a lot of liquid so once defrosted, you’ll want to squeeze our as much liquid as possible. This will keep your dip from being runny. 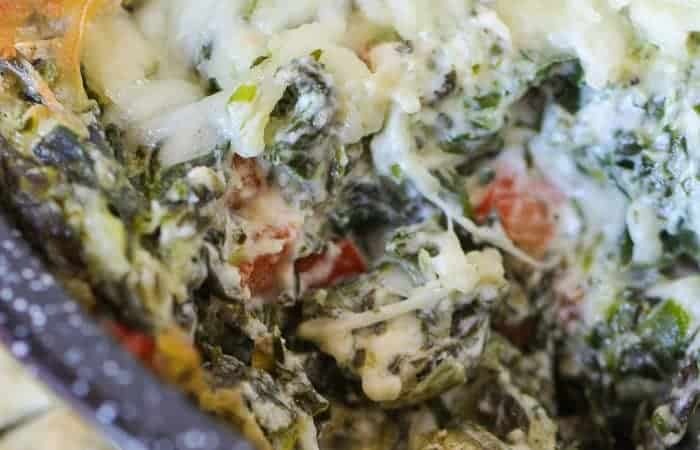 If you’d prefer to make this spinach artichoke dip with fresh spinach, simply chop, cook and squeeze dry 1lb of fresh spinach. Don’t forget to remove any tough stems before cooking. I like to serve this dip with toasted slices of baguette but it’s wonderful with crackers, chunks of sourdough bread or even tortilla chips! If you happen to have flour tortillas on hand, they make great dippers once baked in the oven! Lightly brush them with olive oil (or melted butter) and season them with a pinch of salt and garlic powder. Bake at 350°F 8-10 minutes or until lightly browned and crisp. If you’re looking for a fresh crunch (or to keep this low carb), carrots, celery, mini bell peppers or cucumbers are also great dippers! Just know, if you take this dip with you, you’ll be left with nothing but an empty dish! 5 Minute Taco Dip – Super quick! Jalapeno Popper Dip (Video) Our favorite! Easy Queso Dip – Cheesy goodness! In a bowl combine cream cheese, sour cream, mayonnaise and garlic with a hand mixer until fluffy. Stir in parmesan cheese, 1 cup mozzarella cheese, gruyere cheese, spinach, and artichokes. Place into a 9×9 casserole dish (or deep dish pie plate) and top with remaining 1/2 cup mozzarella cheese. Bake 25-30 minutes or until bubbly and cheese is browned. Slice baguette into 1/2″ slices. Lightly brush one side of each slice with olive oil. Broil the oiled side for about 2 minutes or just until lightly browned. Remove from the oven and gently rub each slice with a clove of garlic. Serve with spinach artichoke dip. *Nutrition information does not include baguette. Zuppa Toscana! A delicious combination of potatoes, sausage and bacon in a light and creamy broth. 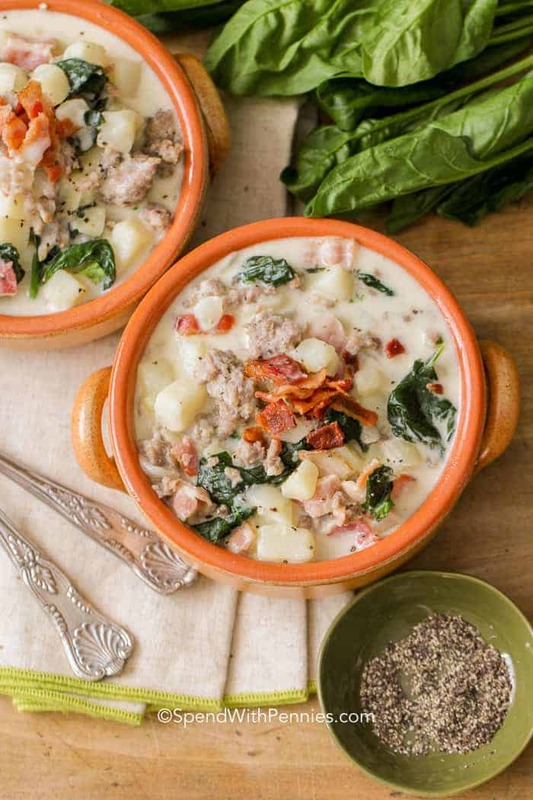 While this is a soup I frequently order from my favorite Italian restaurant, the great news is that Zuppa Toscana is really easy to make at home! 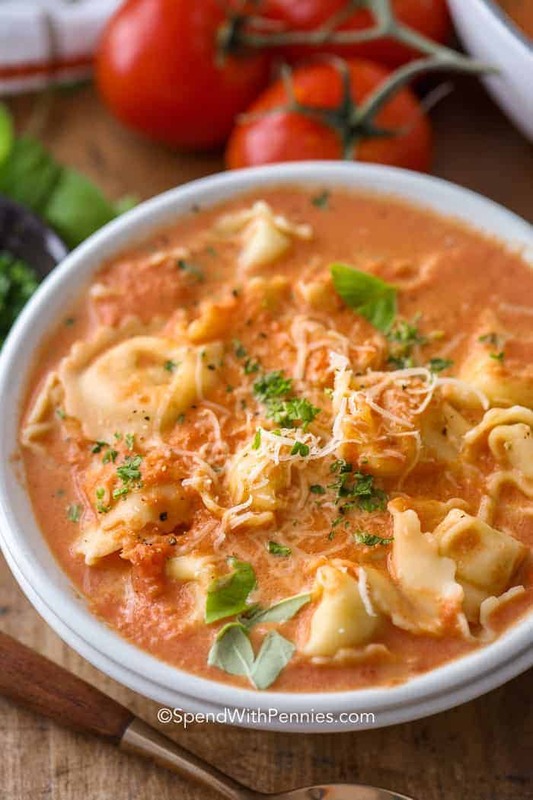 Serve this classic Italian soup recipe with homemade dinner rolls or easy garlic crescents for a delicious meal! 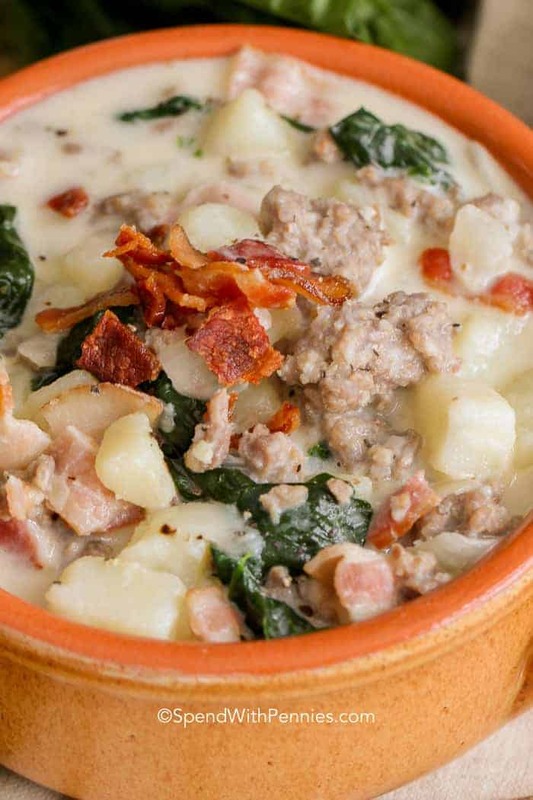 What is Zuppa Toscana Zuppa Toscana simply put is a Tuscan style soup. This hearty Italian soup recipe has potatoes, sausage and bacon in a light, creamy broth. It is delicious and if you’ve ever been to Olive Garden, there’s a good chance you’ve enjoyed their Zuppa Toscana! ! I love to add in bacon (because everything is better with bacon) and sometimes add a can of cannellini beans as well (along with the potatoes). Zuppa Toscana often uses kale but I personally prefer the light flavor of spinach so this recipe contains spinach. If you would rather use kale, add it in along with the chicken broth so it has time to soften. To cut the potatoes into cubes I used my favorite kitchen chopper and was able to do 4 potatoes in about 30 seconds. (I used it for the onions too. It’s one thing I can’t live without in my kitchen, mine is the Vidalia Chop Wizard brand). Brown sausage and onions. Fry bacon. Combine remaining ingredients and simmer until potatoes are soft. Stir in cream and spinach just before serving. It’s really easy to make and perfect to serve with some homemade bread or Homemade Buttermilk Biscuits. 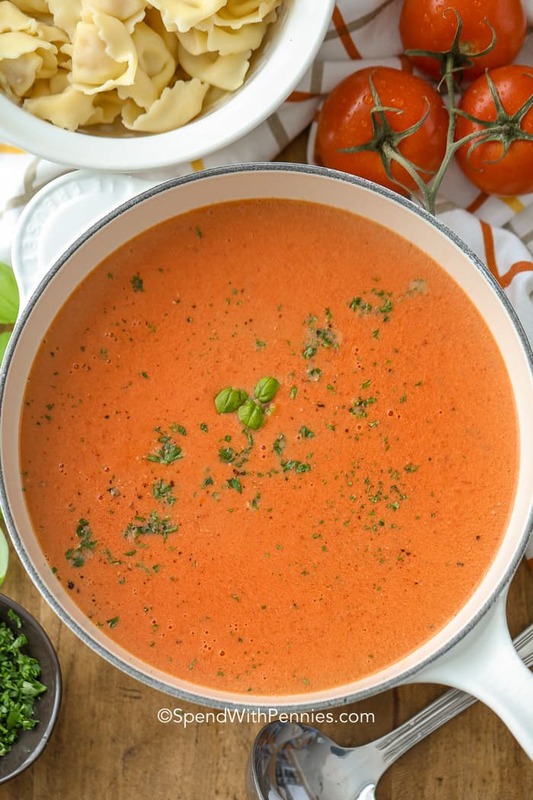 This easy soup doesn’t take long to prep on the stove however sometimes it’s nice to come home to a meal ready to go after a long day of work! I love to use my slow cooker for soups and stews because it allows the flavors to blend and it’s so easy! Brown sausage and onion as directed. Cook bacon. Add all ingredients except cream and spinach/kale to the slow cooker. Cook on high about 3-4 hours (or on low 6-7 hours) or until potatoes are tender. Heat cream and stir in cream and spinach. Cook an additional 20-30 minutes. If you’d like to lighten this soup up a little bit, you can use turkey sausage in place of the pork sausage and reduce the amount of bacon (be sure to drain it very well) or use turkey bacon. While I love the buttery flavor the heavy cream adds, evaporated milk can be used in place of cream in this recipe. 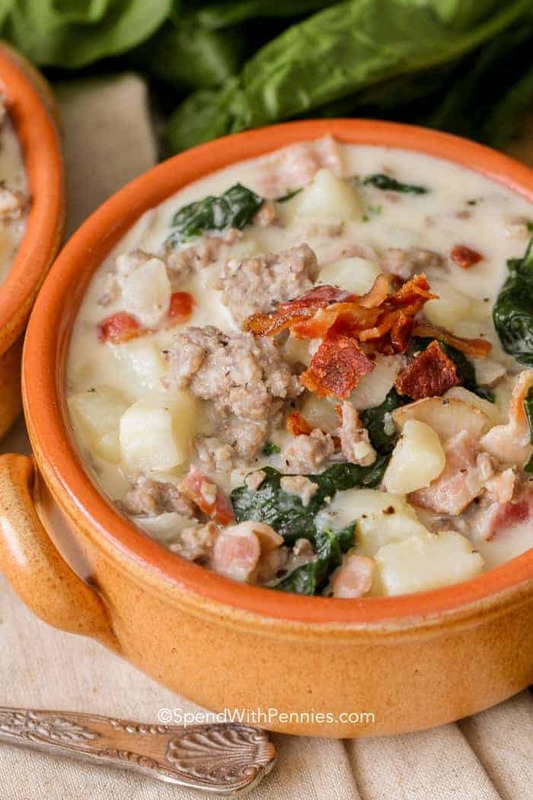 Zuppa Toscana is an easy Italian soup with a rich creamy broth filled with sausage, potatoes and greens. In a large pot cook sausage and onion until no pink remains. Drain and set aside. Cook bacon over medium heat until most of the fat has been rendered out and drain. Add in potatoes, garlic, chicken broth, crushed peppers (if using) and sausage. Bring to a boil. Reduce heat and simmer uncovered 12-14 minutes or until potatoes are softened. Stir in heavy cream and let boil 1 minute. Remove from heat, stir in spinach. Garnish with additional bacon if desired. If using kale in place of spinach, add along with the chicken broth as it takes longer to cook. 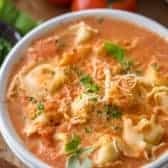 The post Zuppa Toscana appeared first on Spend With Pennies.